This kit recognizes natural and recombinant ANG1. No significant cross-reactivity or interference between ANG1 and analogues was observed. Small volumes of ANG1 clia kit vial(s) may occasionally become entrapped in the seal of the product vial during shipment and storage. If necessary, briefly centrifuge the vial on a tabletop centrifuge to dislodge any liquid in the container`s cap. Certain products may require to ship with dry ice and additional dry ice fee may apply. Intended Uses: This CLIA kit applies to the in vitro quantitative determination of ANG1 concentrations in serum, plasma and other biological fluids. Principle of the Assay: This kit uses Sandwich-CLIA as the method. The micro CLIA plate provided in this kit has been pre-coated with an antibody specific to ANG1. Standards or samples are added to the appropriate micro CLIA plate wells and combined with the specific antibody. Then a biotinylated detection antibody specific for ANG1 and Avidin-Horseradish Peroxidase (HRP) conjugate is added to each micro plate well successively and incubated. Free components are washed away. The substrate solution is added to each well. Only those wells that contain ANG1, biotinylated detection antibody and Avidin-HRP conjugate will appear fluorescence. The Relative light unit (RLU) value is measured spectrophotometrically by the Chemiluminescence immunoassay analyzer. The RLU value is positively associated with the concentration of ANG1. 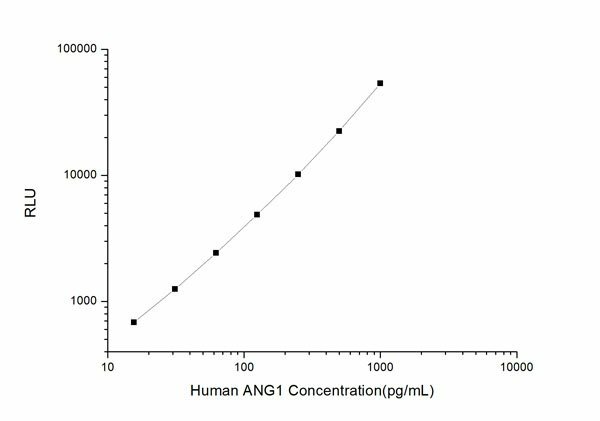 You can calculate the concentration of ANG1 in the samples by comparing the RLU value of the samples to the standard curve. NCBI/Uniprot data below describe general gene information for ANG1. It may not necessarily be applicable to this product. ANGPT1: Binds and activates TEK/TIE2 receptor by inducing its dimerization and tyrosine phosphorylation. Plays an important role in the regulation of angiogenesis, endothelial cell survival, proliferation, migration, adhesion and cell spreading, reorganization of the actin cytoskeleton, but also maintenance of vascular quiescence. Required for normal angiogenesis and heart development during embryogenesis. After birth, activates or inhibits angiogenesis, depending on the context. Inhibits angiogenesis and promotes vascular stability in quiescent vessels, where endothelial cells have tight contacts. In quiescent vessels, ANGPT1 oligomers recruit TEK to cell-cell contacts, forming complexes with TEK molecules from adjoining cells, and this leads to preferential activation of phosphatidylinositol 3-kinase and the AKT1 signaling cascades. In migrating endothelial cells that lack cell-cell adhesions, ANGT1 recruits TEK to contacts with the extracellular matrix, leading to the formation of focal adhesion complexes, activation of PTK2/FAK and of the downstream kinases MAPK1/ERK2 and MAPK3/ERK1, and ultimately to the stimulation of sprouting angiogenesis. Mediates blood vessel maturation/stability. Implicated in endothelial developmental processes later and distinct from that of VEGF. Appears to play a crucial role in mediating reciprocal interactions between the endothelium and surrounding matrix and mesenchyme. 1. serum Ang-1 levels and Ang-1/Ang-2 ratio were significantly reduced and balance was toward Ang-2 in asthmatics children. This process may lead to inflammation, destabilization of blood vessels, and trigger remodeling.